Since 2009, Pure Touch Skin Center has provided skin and beauty treatments to the Los Angeles community with its two locations in Glendale and Sherman Oaks. They are headed up by a strong team of professionals, and specialize in injectables and laser aesthetics. Pure Touch initially hired Alecan Marketing for social media services only, but after this client saw the benefits of expanding services with us, we eventually took over all of their digital marketing. What began as a smaller and more specific service for them ended up transforming into a fully-developed marketing strategy that has increased their customer engagement and leads significantly. Another goal with Pure Touch was to create a new website for them in order to achieve better conversion optimization. Their previous website had been poorly designed and managed by a third party, and because we couldn’t make modifications to it, we re-designed it completely. The website we designed for them has better content, more visual appeal, and funnel pages to generate leads. Pure Touch had originally been managing their own social media in-house, but when they saw that they couldn’t devote the proper amount of time to it, they approached us at Alecan for social media services. They originally wanted us to simply keep their social actively updated, but we explained that it isn’t just about keeping it updated—it’s also about harnessing the power of social media and having an aggressive approach in order to get customers. When we took over the client’s social media, we discussed the benefits of paid Facebook ads, and how the ads can be tailored and customers can be targeted to generate more leads. Once Pure Touch agreed to this and we began, they saw significant results in a short amount of time. With our approach, we were able to increase followers, engagement, and click-through rates. We also tapped into influencers who could utilize their branding to give Pure Touch a boost. Our strategy for this client’s social media produced growth in all areas. Another approach we took with this client’s social media was to have Facebook ads to work hand-in-hand with on-site funnel pages that we created. These funnel pages showcased the client’s monthly specials, and this strategy generated numerous leads for the business. This was another area where our client was very satisfied. As a result of the success we had with their social media, Pure Touch decided to have our team at Alecan to extend our services to cover all of their digital marketing needs. We fully took over their site, re-designing and optimizing it for search engines and improved user experience. Once we extended our services for the client, we were able to take their site to the next level, providing them with even stronger digital presence. The previous website that Pure Touch had was not hitting any of the marks that a good business should have. Their old website didn’t inform users well, there were no call-to-actions, it was not optimized for search engines, and it wasn’t visually appealing. When we took on this client’s re-branding and re-design, we considered conversion optimization in all aspects. We made their site more visually appealing and more educational, with informative content about all of their services. We also included effective call-to-actions for user engagement. 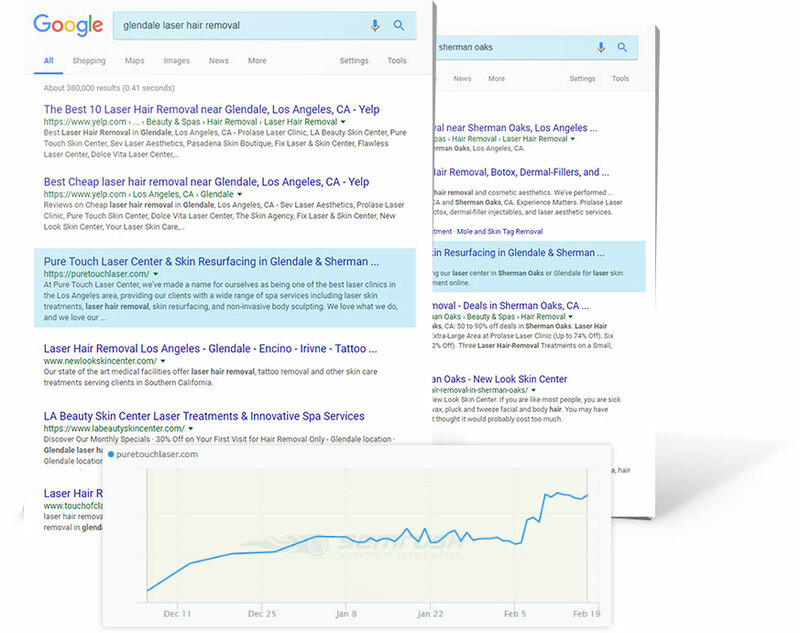 When we re-designed the Pure Touch Skin Center website, we optimized it for local search, keeping in mind that they have two locations in Glendale and Sherman Oaks. Because of the local search strategies that we implemented, this client now has a top ranking on Google for both locations. Before the Alecan team began working on email marketing for Pure Touch, they were attempting to do it themselves. Their in-house email marketing consisted of nothing but monthly specials being sent out as newsletters, which was not only dull, but also ineffective. We collected data from these newsletters and saw that their customers needed more engagement and that there was a lot of room for improvement. As a result, we created newsletters that included not just the monthly specials, but also beauty tips, helpful information, videos from the staff, the latest blog posts, call-to-actions, and more. This provided their subscribers with something valuable; something they could look forward to receiving. Once we improved the newsletters, the business saw a huge increase in monthly subscribers, click-throughs, and returning customers. Alecan is the most professional and excellent internet marketing team anyone can work with. They exceeded our companies expectations and made it as easy as possible to create the most beautiful website that we had envisioned. Their professionalism, attention to detail and prompt responses to questions were impeccable. 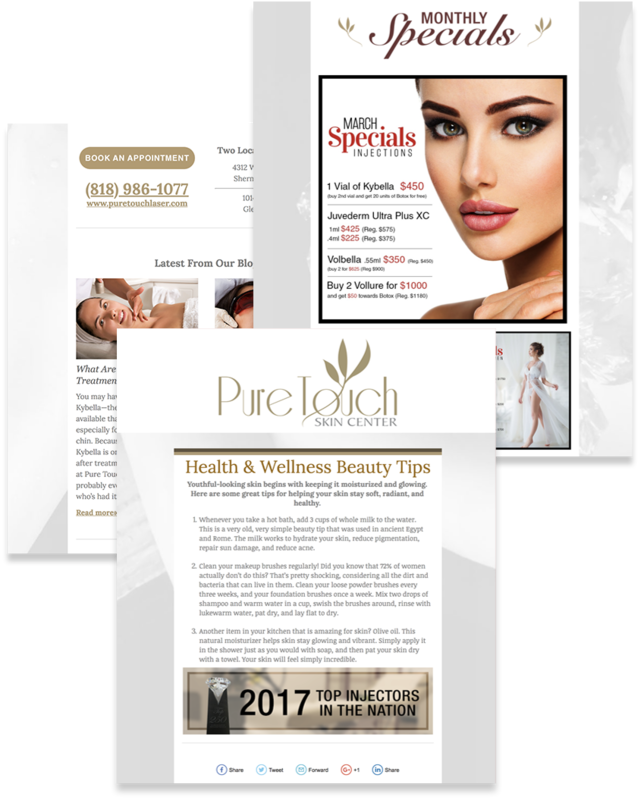 They made Pure Touch Skin Centers website come alive again and because of them we are generating a lot of leads. They have also made our social media pages come alive with their amazing designs, knowledge of the industry and passion to make their clients happy. They truly care about us as people and are there to help us in whatever way we need. Its incredibly valuable to have a company like Alecan that researches and makes sure everything fits our needs.